A number of additional elements have been added to the core content of the Subliminal World web site. Included amongst these are information links. These are indicated by the fading image shown on the left. On pages other than the present page, click on these and quick access is assured to key pages of information. Each Web page may also have a Bonus Box and a Subliminal Sideline as 'Attachments' to the main page. Run the mouse over either of the Xtra signs to find out what is on offer. The items in the Bonus Box can be appreciated at any time. But note that they are most often presented in the form of Java applets. They can only be viewed when your browser is Java enabled. Bonus Box items can easily be appreciated at any time. However, before viewing Subliminal Sidelines it is suggested that you become reasonably familiar with the topic of semi-subliminal ads. Although the author considers most of the Sideliines to be humorous or satirical, these are only likely to appeal to those familiar with British popular culture. However, a sufficient number of these are based on historical and entertainment figures of international reknown. These should allow anyone, of any nationality, to find Sidelines of interest. 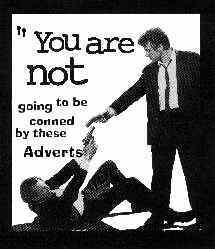 For additional sources of ad parodies see Bonnie Vierthaler's BaDvertising Institute Gallery and, of course, Adbusters.